Already have for 10 years and still sound the same. I really like that heaviness around 30 Hz which it delivers. Really must say - one of the best products for the price from B&W and looks nice as well. Super tight hard hitting bass. This is by far the best sub I have heard and used. Don't let the size of this thing fool you. If you want a sub that can rattle your walls and still want clean tight deep bass this is for you. If you are looking for a small musical sub to match some nice bookshelfs or a smaller home theater setup this is it. I tested this among 4 other sub $400 subs and it blew them all out of the water. Including Polk, mirage, klipsh and velodyne. Do not let the conservative 100W amp fool you this is a very clean 100W amp I have the volume set to only 45%. It can easily fill my office with music. Do not be afraid of the 8in woofer. As a matter of fact that is what makes it so nice smaller woofer is tighter and more responsive which makes it more musical. But yet this little guy can still get down to 27Hz and performs great on action movies. 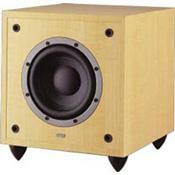 I have it in my office which has NAD C740 stereo receiver and B&W 601 speakers. It blends so nicely with my 601s I do not even know it is there. I have my crossover freq set to approx 90Hz. I also have a dvd player back there for dvd audio and occasional movie. I tell you what the sound these two speakers and sub put out is very pleasant for movies. As a matter of fact I prefer to watch Red Violin in this setup compared to my HT room. This little sub has all the niceties you need RCA inputs, Speaker inputs(this is what I use), High pass Line outs, volume level and crossover freq.